Unfortunately, none of the links work just yet. So, we basically have the main page and that's it. 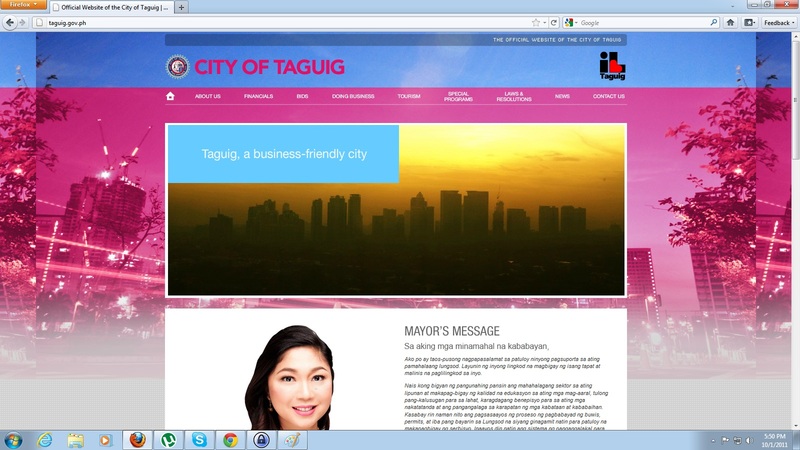 But there's supposedly a Facebook and Twitter account, and information about Taguig, its financials, special programs, tourism and other news. It looks like it will be complying with the Citizen-Centric Website Development Guide issued by the Commission on Information & Communications Technology on the general guidelines to be observed by a local government unit in designing it's website as discussed in a post I made last November 2010. Considering, however, that it took more than a year to put up the main page, I'm not holding my breath for the other features. But hey, it's a start. I got really inspired with your blog. So I wrote this and sent to the concerned people. Hand in hand, I know we Filipinos can help the economy.